Catnip - what's all the fuss about? 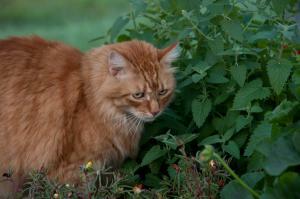 Everyone knows that cats go wild for catnip, but why? Considering many people compare its hallucinogenic effect in cats to marijuana in humans, isn’t it surprising we happily expose our animals to it? Of course the two are gulfs apart; catnip doesn’t have any detrimental health impacts, for one thing; neither is it addictive. Yet, cats really do exhibit signs of intoxication when exposed to it, which interestingly, is a behaviour we try to promote. Scientists and veterinarians are still unsure as to why it produces such a response in cats, although we do know how the chemicals contained in the herb stimulate the feline sensory systems. Native to Europe but now grown globally, catnip or Nepeta Cataria as it is formally known, is a herb that falls within the mint family Labiatae. A relative of spearmint and oregano, the herb boasts a distinctive scent and has various medicinal uses in humans. Some people swear by its powers in aiding digestion, skin complaints, anxiety and insomnia, and various other common ailments. Contained within the stem and leaves of Nepeta Cataria is an active molecule called nepetalactone, an organic attractant that is irresistible to cats when inhaled or ingested. Why it is irresistible to cats is uncertain, although the degree to which it triggers a response is hereditary. Being autosomal dominant, a cat only has to have one parent with a sensitivity to catnip for the trait to pass down. You will only be able to judge this when a kitten is over 8 weeks old as, ironically, catnip repels very young animals. Once a cat inhales catnip, the molecule nepetalactone binds to olfactory receptors (responsible for detecting odours), which in turn stimulate sensory neurons signalling to the brain. This affects the behaviour of the animal almost immediately. On detecting catnip, a cat will exhibit a range of behaviours, from sniffing to licking to stretching. A cat is also likely to roll in the herb if given in its dried form, or ingest it. Toys containing catnip are excessively licked or played with and many cats will display signs of hyperactivity or aggression, especially if someone tries to remove or interfere with the herb. You could say that cats exposed to catnip behave similarly to queens in heat. Euphoria, arousal or sedation are common responses and cats will usually sleep or show fatigue after the initial response has worn off. Although catnip is appreciated in the human world for its calming, sedative qualities, in the cat world the herb can induce a high which provokes wild and uncharacteristic behaviours. This ‘high’ is said to compare to marijuana or LSD intake by humans (although we don’t recommend comparing them), but without the negative health implications. It is likely that the elation and playfulness exhibited by cats is caused by catnip inducing feel good pheromones, similar to those they experience during sexual interaction. The effect of catnip is short-lived, approximately 10 minutes, after which time a cat will lose interest in the herb altogether and retreat somewhere to sleep it off. Cats are usually receptive to it again after 30 minutes and will exhibit all the same behaviours. It is not only domestic cats that respond to the Nepeta Cataria herb and studies have shown that big cats such as tigers and leopards are also affected by it. So, what is the downside to catnip? Well, so far there isn’t one. If too much of the dried herb is ingested it can cause nausea, vomiting and diarrhoea although this is uncommon and self-limiting (a cat will stop showing these symptoms as soon as the catnip is taken away). Also, if a cat acts aggressively during exposure to the herb, all you need do is retract the catnip or avoid it until the effects have subsided and your cat is relaxed again. VioVet stocks a range of catnip products for your cat’s enjoyment, including a selection of catnip toys and supplements. If your cat responds to catnip, please let us know! Does she get excited/aggressive, have a favourite catnip toy, or is she completely unaffected by it? We would love to hear your stories. My boy cat loves toys with dry catnip and licks them for ages. My girl cat loves the fresh plant and rolls around in the leaves. I love Nepeta in the garden so a few years ago I bought a couple of plants. They were quite large plants when I bought them so looked really good when I planted them. Next day when I walked around the garden I discovered the plants had been flattened and ripped to pieces! When my cats came in for their food they all had bits of the plants in their fur and smelled unmistakably of Nepeta or 'catmint' as I read was the other name. Needless to say I haven't bothered to buy any more! I have tried to grow Catnip so many times, but the cats eat it before it can get really started. Has anyone any solutions? It does not matter where I put it, they will find it and destroy the whole pot. If you put an upturned wire hanging basket frame over the plant when you put it in the ground it will protect the roots but still allow your cats to access the leaves.